The goal: To create a true boulevard that enables walkable, neighborhood-appropriate mixed uses. It’s intended to be a “green” corridor because it’s designed to make the most of state-of-the-art storm water management systems and other environmentally friendly techniques. In the video below, specialists from all three project teams – those working on components funded by the U.S. Department of Housing and Urban Development (HUD), the Environmental Protection Agency (EPA), and the U.S. Department of Transportation (DOT) – explain their roles. To see how the new green corridor fits within the broader goals of the workshop, check out the overview column to the immediate right and the posts preceding this one. 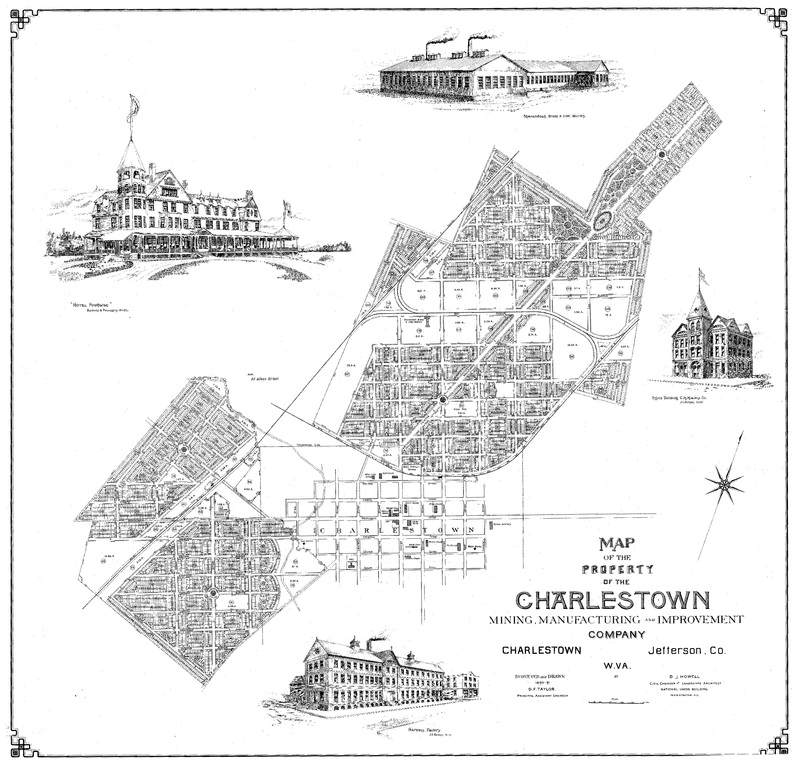 The 1890 plan for what is now Ranson and Charles Town. Click for larger view. The inspiration for the green corridor comes partly from history. The 1890 plat of the Charles Town/Ranson area depicts a connective spine integrating neighborhoods and what are now the commercial districts of the two towns. Though Ranson wasn’t incorporated until 1910, the original design for the boulevard seamlessly links the two towns. Design of the boulevard is funded primarily through DOT. Read more about the overall transportation planning effort here. But because properties within the corridor area are former industrial sites prime for redevelopment, the EPA-funded focus on “brownfield” sites offers an opportunity to combine community and federal agency goals. Read more about the EPA-funded efforts here. The same goes for the HUD-financed land use planning and zoning component. The goal is to assure that redevelopment follows rules that encourage walkable neighborhoods and appropriate commercial uses mixed in with a broad range of residential options. So the regulatory framework has to support that. And the “form-based” coding approach customized for Ranson/Charles Town by the project’s coding specialists will do just that.